The war in Eastern Ukraine has been devastating enough for families struggling to survive in this dangerous region since 2014. But imagine enduring even more … such as an unthinkable, life-threatening tragedy that struck a mother and her child. Thanks to your generous support and prayers, our SGA team members have been able to reach out with the hope of the Gospel and financial aid to Svetlana and Angelina. We are helping a young mother named Svetlana and her 8-year-old daughter Angelina. They have been in the hospital for six months after being badly burned in a fire. They had been forced to move from an apartment in eastern Ukraine because it was destroyed by shelling in the war. The rented apartment they had moved to had a defective gas line. When Svetlana turned on the lights, the gas exploded and she was caught in the flames. Her daughter heard Svetlana screaming and when she ran into the room, she was also burned. Both have undergone multiple surgeries and will need further treatment. We heard about their situation from other believers, and we have visited them regularly, taking them funds to help with their treatment as well as Christian literature. We and the family are very thankful to God for His provision. 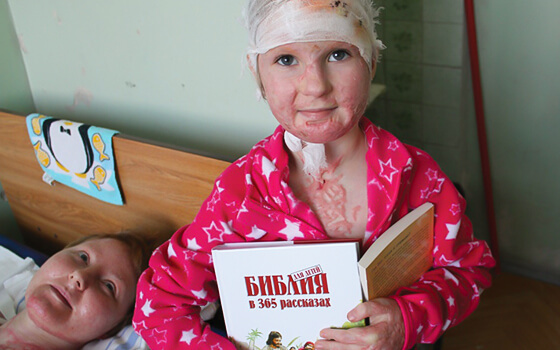 Please pray for Svetlana and her daughter, for their healing and for their salvation!